You Neighborhood Plumbing Professionals Were Just In Your Neighborhood. Did You See The Fox? Fox Plumbing & Heating is working with your friends, family and neighbors all the time. Sometimes we do such a wonderful job that you wouldn't even know we were there. 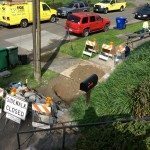 Recently, the Fox Plumbing & Heating crew were in Ballard to do a little 80 foot sewer pipe burst. 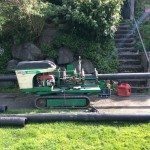 The professionals at Fox Plumbing & Heating came in on a Wednesday and were able to replace the entire common sewer line before the weekend. 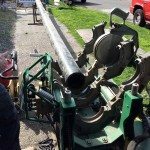 We thought this job was special because the guys were working with 6 inch pipe as opposed to a traditional 4 inch pipe. 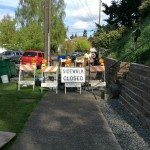 A common sewer line runs from the home to the sewer’s right-of-way – this is where your sewer meets the city’s sewer pipe. And you’re responsible for the sewer line from the right-of-way to your home. 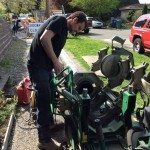 In most cases people have a 4 inch side sewer line that runs from their home to the city right-of-way. 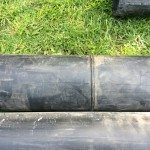 In a few cases, you might be sharing your sewer line with your neighbor or neighbors, and this is what we refer to as a common line. It depends on when your home was built or how close you are to your neighbors. 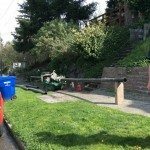 In this case, two neighbors share one sewer line that came out from the homes and connected immediately before proceeding to the city’s right-of-way. 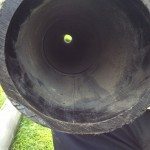 Due to the length of this sewer line, Fox’s sewer lead, Wyll A. had to fuse together 4, 20ft sticks of high density polyethylene (HDP) lines to make one long 80ft pipe. In the pictures, you can see some of the hard work and effort that went into making this project possible. Wyll and his team worked for several hours to prep and then used a technique called sewer pipe bursting. 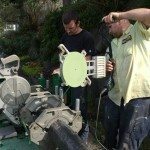 Sewer pipe bursting is a technique that Fox Plumbing & Heating uses to help save our friends, neighbors and family time and money when replacing a sewer line. 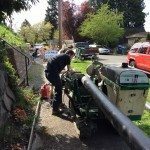 We use a sewer pipe bursting machine that goes along, inside the current line, breaking and pushing it out of the way and dragging the new sewer line behind. 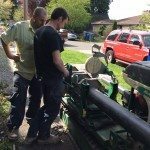 This process means that you don’t need to open trench the entire line this saves on landscaping costs. 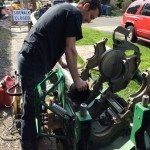 You only have to expose the sewer line at your house and where it ties into the street, any other branch lines, ie. laundry, downspouts, etc. 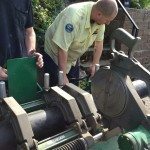 This process cuts the time that it takes to complete the sewer line replacement in half. 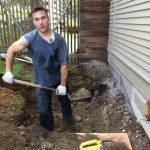 Fox Plumbing & Heating does such an amazing job leaving your home in the same condition that sometimes people aren't aware of all the effort and hard work that goes into making this happen. 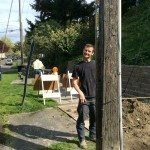 That’s why Fox Plumbing & Heating is #1 in customer satisfaction for plumbing, heating and cooling in Bellevue, Burien, Seattle and King County.